It wasn’t a minor tremor barely felt. It wasn’t a raucous shimmy that shattered every pane of glass. It wasn’t a rumble that sent people running for doorways and diving beneath tables. It was simply a shrug. Two shoulders, a sigh, and a quick spin. All I saw were the backs turning. 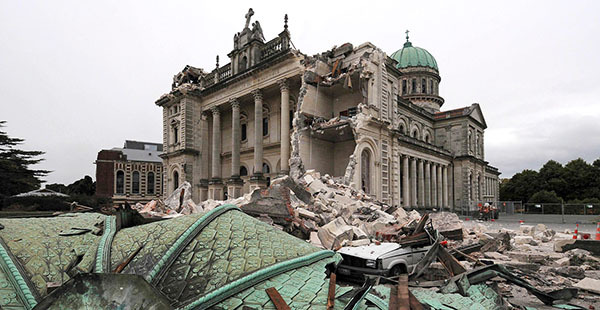 That was the earthquake that changed the world. They had valid points and plenty of reasons, and those I don’t begrudge them. I didn’t need to hear their reasons, their excuses, their futile attempt to assuage their guilt. I expected that they would embrace me the way I had embraced them. That they would lift me back up from where I had fallen as I know I would do for them. I expected something more than excuses and a shrug. A kind word. A sympathetic ear. Anything. But it didn’t come. And it shook me. I never asked for anything in return when they asked for help. And yet here I was, in need, unsure, helpless, for the first time I could remember, and they shrugged. And it shook me. Suddenly, it wasn’t there. And they were liars, and false prophets, and all the things I knew in my heart they could never, should never be. All the maps I had drawn in my head, the masses I trusted to be there when I sent myself afloat across the oceans, the rocks and pillars that promised a new life, or at least a safe haven, they dissolved in the water, washed away in my tears. The truths and facts I knew came undone, the faith I had invested went unreturned, and the borders I had carefully respected turned out to be empty falsified lines marked the edge of an expanse so vast I couldn’t even see the other side anymore. My pangea had divided, spreading across the globe, torn asunder like a virtual tower of Babel. That was the earthquake that shook the world. But there, in the aftermath, among the ruins of my life, there was a light. It shone from unexpected corners, from the dimmest furthest reaches of my existence. And it shone brightly. I felt hands reach through the rubble, calm, loving voices carrying through the pain and the anguish and the fear. I felt cradled and caressed, the dust brushed off, my aching back soothed, and a warm, beautiful embrace take me. And the eyes that met mine, the faces that smiled back at my ugly, crying face, weren’t the ones I expected. But they were there. They were there for me, and I love them ever more for it. My map had been redrawn, my borders reexplored. I found allies where I thought only neutral states existed. I found aid exploding from empty waters, molten, hot, and soothing. I basked in their steam, amazed at what had grown where I thought there was nothing.